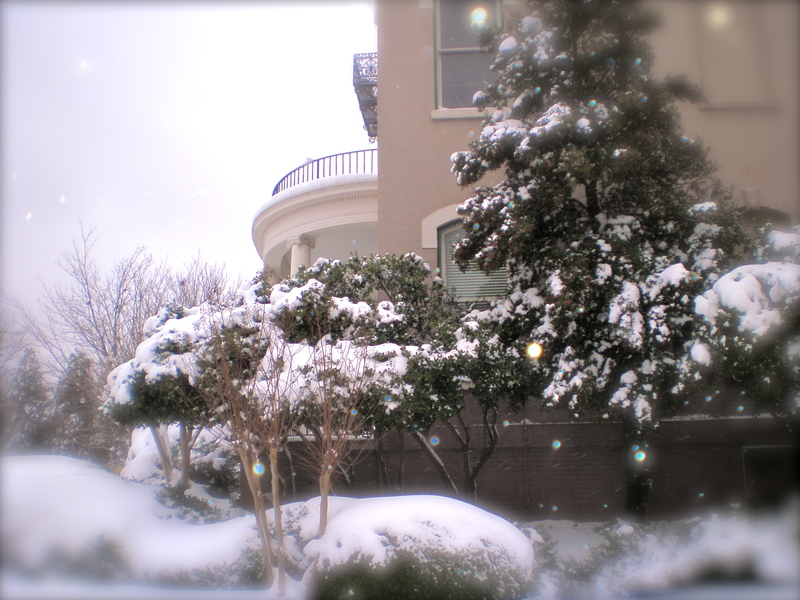 Because outside looked like this throughout the whole weekend, some creativity had to come out of being snowed in (i.e. whipping up a decent meal with what you already have in the fridge)! I believe the snow definitely has some sort of physiological effect on people. Our arms and legs refuse to move, our bum stays nestled underneath the bed covers or deeply seated on the couch. The t.v. miraculously decides to play marathons of our favorite movies and lo and behold, there’s one more bottle of wine left in the fridge. I love it when, after leaving your bed to go to the kitchen for a cup of tea/outside for the paper, and you crawl back in bed – the warmth in the covers from your sleep is still there. Ohh it’s enough to coax me into never getting out..of bed..ever. After a quick peek outside my window, it was enough to see that the snow was not letting up any time soon and the inches on the ground were steadily rising. At this point, the last thing I wanted to do was make a trip to the grocery store and so for the moment, I shopped around in my fridge for something I could make for breakfast. 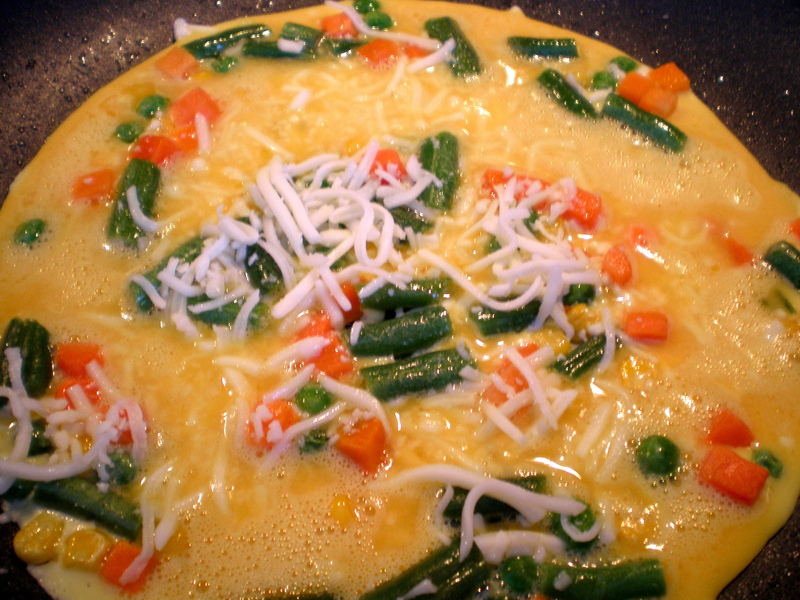 Step 2: While the veggies are heating up, beat two eggs until frothy. Season with salt and pepper. 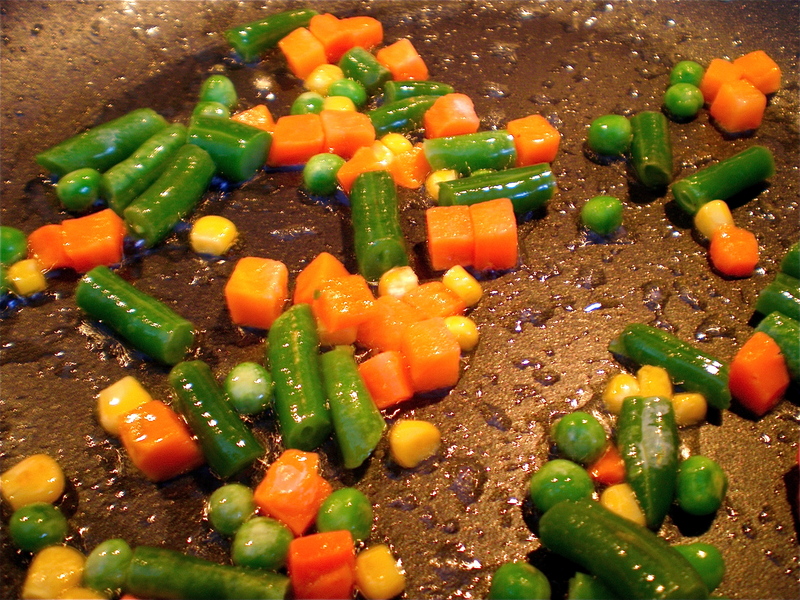 Step 3: Turn the heat to low once the veggies are hot, and slowly pour in the eggs. Add a sprinkle of cheese. Or in my case, a handful. Give it about a minute or two on this side. 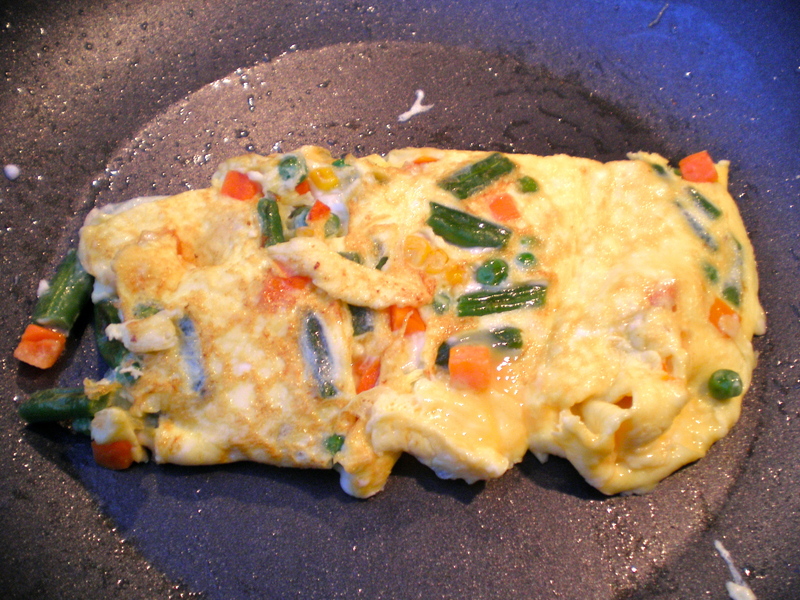 Step 4: Fold over the left side and right side of the omelet and then flip it over. Give it another 2 minutes on this side. Make sure there are no runny uncooked parts of the egg left before you plate it (salmonella eeek! ). 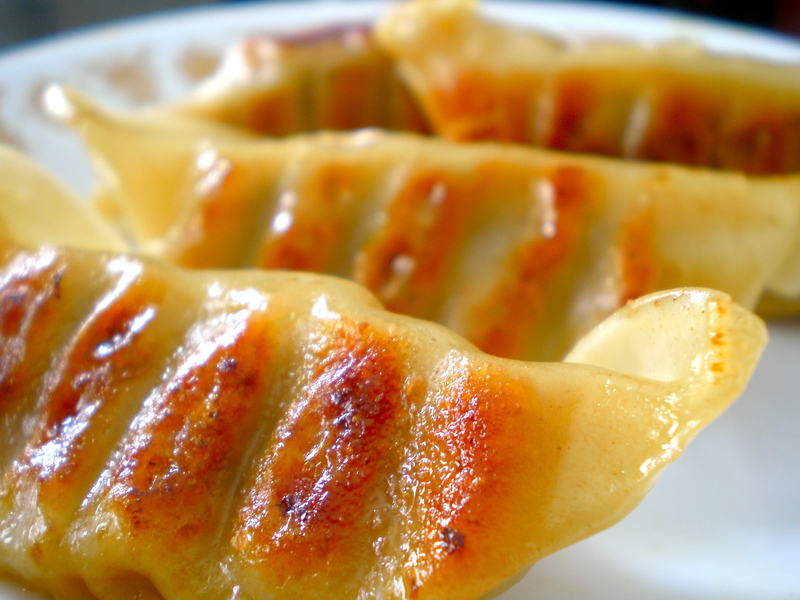 The dumplings were pretty straightforward. I bought them frozen and followed the directions on the bag. You could microwave them too but I prefer a nice golden brown sear to them. 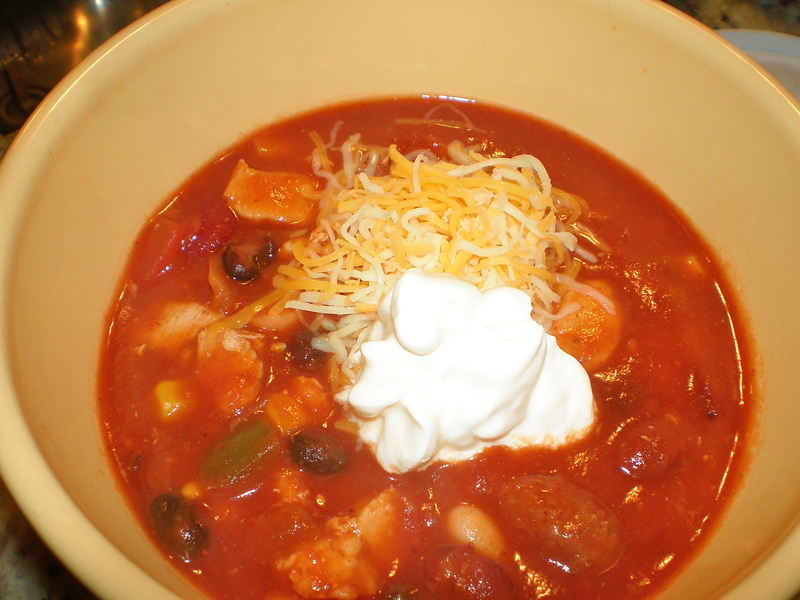 Later on the afternoon, a few friends and I got together to watch a basketball game and I decided to make a friend’s chicken chili recipe that looked way too good and too easy to make – perfect for snowed-in symptoms. I tweaked the recipe a little by dicing the chicken and sauteing it in a pan prior to adding it to the mix (which shortened the cook time up to 45 minutes instead of 6-7 hours). The original recipe recommends slow cooking the chicken for 6-7 hours in a crock pot, taking it out and shredding it, and then put it back into the mix. I couldn’t imagine how sauteing the chicken could be any different – it tasted delish all the same! Step 1: Combine chili, beans, corn, salsa and tomato sauce in a pot and heat through then leave on simmer. Step 3: Dice the chicken into cubes and season with salt and pepper. Step 4: When pan is hot, drop in the chicken and saute for about 5-7 minutes or until the chicken is cooked through and has achieved a nice golden brown color. Step 5: When chicken is cooked, mix it into the chili and let it simmer for an additional 10 minutes. Taste and season with salt as needed then serve! 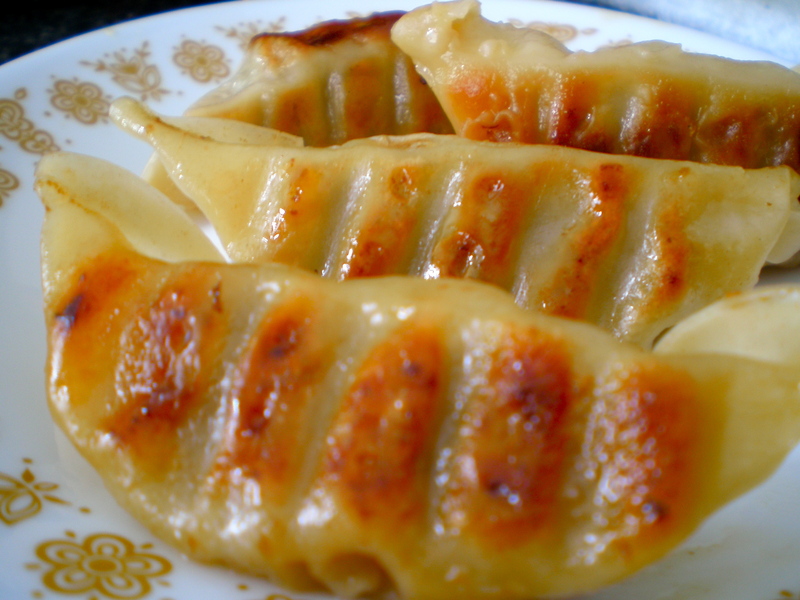 You can top these with a variety of things like cheese, sour cream, or hot sauce to your liking. 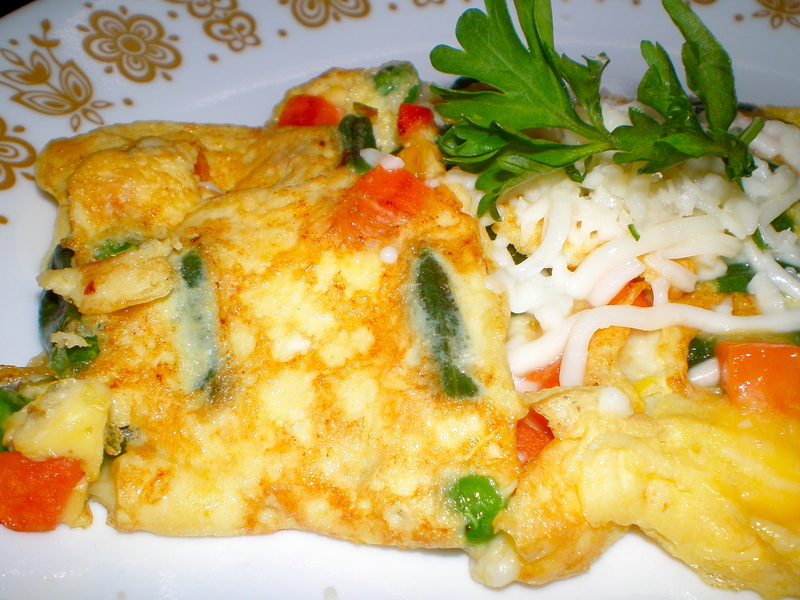 Serve with dinner rolls or potato chips. I prefer kettle cooked with ridges or croutons, mmm. For all you others who are snowed in or not, this recipe is a must!! You can even leave out the chicken (if you’re feeling ultra lazy) and I think it would taste just fine. If you love corn, (like me) double the cans. Ultimately, the best thing about snow is that it eventually goes away. But until then, I’m grateful that it gave me an opportunity to get creative in the kitchen. Until next time, food lovers! Mmmm! 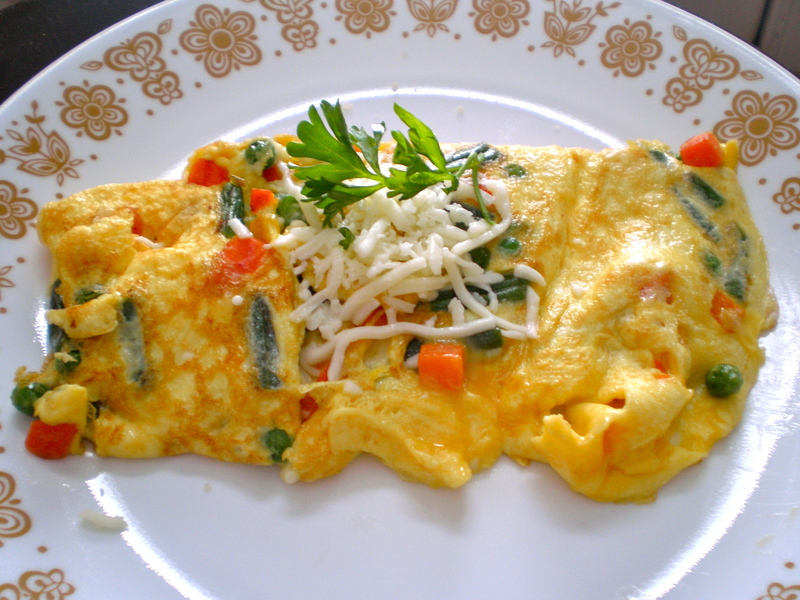 I’m going to make that cheese omlet this week. Thanks for sharing! Anytime! Frozen spinach works great too (if you like spinach). Hope you had fun at the superbowl party at Michelle’s. Wish I could have been there..damn snow. LOL @ the plates. Let me tell you how much I wished I had some plain whites on hand. Oh well, next time! I’m still at the same place, the picture was just taken while I was driving around the city. I had some of the leftover chili today…. SOO YUMMM! =D And seriously, that was the fastest I’ve ever seen anyone make a whole pot of chili. And now you can make super fast chili too!! No one will ever know you took a detour hahaha =p. Glad I left the leftovers at your place!! I’m sure your local grocer has em! I just ate my last 4 for lunch today..sad news..
those eggs look perfect and i bet they were delish! i too feel ya on that leaving your bed for a sec all to come back to the warmness of the spot where you were layin..feels so good! isn’t it the bessttttt?! Did that this morning and I shouldn’t have. I didn’t want to go to work *hmph* ! !